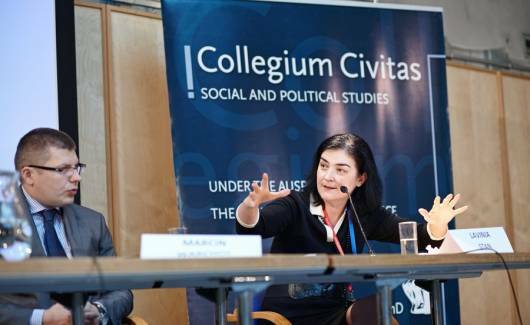 Interview with Professor Lavinia Stan: The Romanian example has shown that demands for radical accountability can lead to a situation in which hardly any account settling occurs. Andrzej Stankiewicz: What is transitional justice, especially in our part of Europe? Lavinia Stan: This is an attempt to settle accounts with the legacy of a dark and gloomy past. The countries of our part of Europe have had a difficult Nazi and communist past. In Romania, this included crimes committed during the revolution, and in former Yugoslavia – during the civil war. But this is an entirely different fate, a different kind of gloom. Does any common denominator, therefore, exist when it comes to settling accounts with the past? There are practices and processes that have been common to nearly all the region's countries. It is another matter whether this has resulted from a mutual flow of ideas or taken shape independently. Those common areas pertain to politics, public debate and the legal situation. In most cases account settling has involved judicial proceedings. Access to secret police files was provided. The issue of restitution of illegally taken-over property emerged, although at times little has come of it, as in Poland's case. Our region's specific feature has been vetting – one of the most controversial instruments of justice in the transformation period. Another important phenomenon has been memorialisation – the destruction of some monuments and their replacement with others, as well as a change of symbols and street names. You are studying the influence of civil society on account settling with totalitarian systems, and focus on the perspectives of three different groups: victims, the intellectual elite and the totalitarian elite (‘nomenklatura’). Nearly everyone wants to regard themselves as victims of the former system. But not all of us were victims. Most people supported the dictatorship through their passivity. But how many people of my generation will admit it? Each of these groups – true victims, the system's dignitaries and intellectuals – perceive justice of the transformation period differently. Let's take Romania. Victims demanded radical vetting, putting secret informers of the Securitate on trial and sacking them from their jobs. To people wronged by the regime, vetting regulations were never sufficiently severe. They wanted to entirely eliminate people of the ancien régime from public life. Punishing collaborators became a symbol of justice to them. Such demands emerged soon after the collapse of the dictatorship of Nicolae Ceauşescu in the Timişoara Proclamation of 1990. These, of course, were never fulfilled by the political class, which in Romania was in a large part rooted in the former Communist Party. In Poland the former democratic opposition was divided to a greater extent. A portion of the right-wing politicians demanded vetting, whilst centre-left politicians were opposed. In Romania such harsh rhetoric by the regime's victims resulted from the way the dictatorship was overthrown – in bloody revolution. We lacked ‘round-table’ talks. Because of the bloodshed, the regime's victims did not want dialogue with their former oppressors, and it boiled down to a case of ‘we or they’. At the same time, the Romanian example has shown that demands for radical accountability can lead to a situation in which hardly any account settling occurs. You ascribe none too flattering a role to intellectuals, accusing them of agreeing to some measure of account settling while blocking attempts to bring the dictatorship to account. In Romania intellectuals played a significant role because some of them were dissidents, whereas in our country there were few such people. We do not have a civil society; hence nothing like Solidarity ever arose in Romania. After the revolution, intellectuals became very influential. It was they who made public opinion aware of the demands on which accountability was based. But mindful of the victims, intellectuals always softened the demands. Subsequently, it turned out that some of the intellectuals had a disreputable past by virtue of having collaborated with the regime. Intellectuals politicised account settling and diminished public support for transformation solidarity. The third group comprised Communist Party dignitaries, people attached to special services and other beneficiaries of the former system. In most of the region's countries they retained significant influence on public and political life for years. When I initially became involved with transitional justice, my research focused on groups advocating account settling. But in Romania, I saw a different situation with my own eyes. One of the most vociferous groups were tenants residing in property that had been illegally taken from its former owners. To make things clear, these were not poor workers or rank-and-file hirelings of socialism, but representatives of the former regime's elite. Very quickly they organised themselves, acted very effectively and blocked the restitution of property to the heirs of their former owners. They convinced politicians to legally safeguard their interests including the right to continued residence in flats confiscated during the communist era and their purchase in the event that their former owners had no heirs. Perhaps there are countries in our region where transitional justice is only a pretence? Even in Romania, which has done less in many areas than other Central European countries, there has been clear progress in the realm of transitional justice. In spite of everything, some real estate is being returned, and this process is far more advanced than in Poland. Restitution of the property of the biggest religious denomination, the Eastern Orthodox Church, as well as the Greek Catholic Church is moving forward. Which country is the most advanced in terms of account settling? The Czech Republic, Slovakia, Poland, Hungary and the Baltic states have done the most to settle accounts with the past. In Romania and Bulgaria there are regulations on the books enabling account settling, but life is what it is, and a great deal still needs to be changed. Albania and the post-Soviet countries of Central Asia have achieved the least. Russia is regressing compared to the Gorbachev era. When will the administration of transitional justice be completed in our part of Europe? It will not end as long as a significant portion of society continues to lodge claims that the authorities are unable to fulfil. In Poland, the question of property restitution must be resolved. This issue has far-reaching legal and financial consequences, and thus account settling with communism cannot be completed without resolving it. In Romania, authentic vetting continues to be a problem, Up until 2006, secret files were controlled by the new security services that were largely comprised of former Securitate officers, as there was no verification of special services in Romania. Access to these files continues to be limited. Please do not ask whether vetting makes sense this late in the game – this is an entirely different matter. However, the victims do need a symbol. Do you support settling accounts with former Communist Party leaders by means of court proceedings? I know that discussions are also under way in Poland as to whether a dictator who has peacefully handed over power should be absolved of his past transgressions. Personally, I believe dictators should be put on trial if there is evidence that they broke the law. >>Professor LAVINIA STAN is a Romanian political scientist with books and articles to her credit. She is employed at the Centre for Post-Communist Studies at Canada's St Francis Xavier University. A year ago, together with Dr Nadya Nedelsky, she published the Encyclopaedia of Transitional Justice, the first comprehensive work devoted to the accountability of dictatorial regimes. Settling accounts with Nazism and communism, even with apartheid and the dictatorships of South America has become a scholarly discipline in its own right. Its distinguished researchers met during a seminar in Warsaw. Research on the mechanisms of what has come to be known as transitional justice got under way in earnest at the turn of the 1990s, when communism in Central-East Europe was headed for the dustbin of history. Transitional justice is the broadly conceived settling of accounts with receding totalitarian systems, carried out by new democratic authorities. This goes beyond legal regulations alone such as bringing criminals to justice, and also involves social phenomena accompanying the collapse of regimes. At present, this field of study, touching on law, history and the social sciences, encompasses research on the consequences of the collapse of all the world's 20th-century dictatorships, including de-Nazification and de-communisation. It also involves vetting and access to regime files, rehabilitation of political prisoners and restitution of nationalised property. 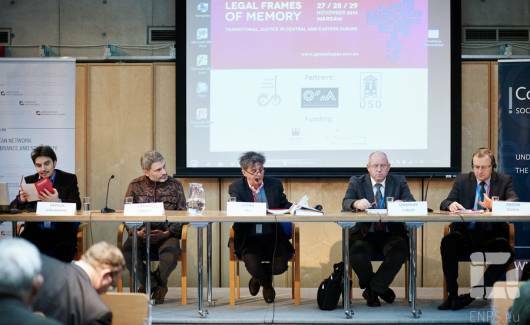 Researchers of transitional justice met in Warsaw at an international conference titled ‘Legal Frames of Memory. Transitional Justice in Central and Eastern Europe’ (27-29 November 2013). 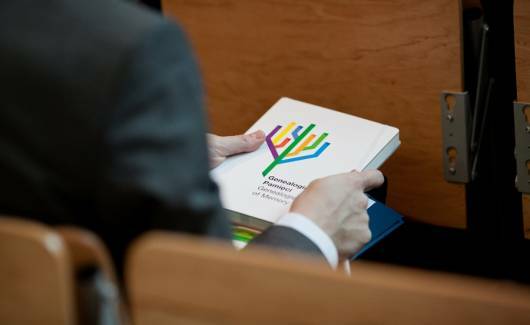 The conference was an element of the Genealogies of Memory project launched in 2011 and carried out by European Network Remembrance and Solidarity. Does a single model of transitional justice for countries leaving dictatorships behind them exist? ‘The situation of each country is different, but there are similarities,’ said Professor Adam Czarnota, a legal expert who lectures at universities in Poland, Australia and Western Europe. The professor has only just returned from Argentina, a country in the process of healing its wounds following the military dictatorship of the 1970s and 1980s. He shows a snapshot he took during a visit to Buenos Aires. It shows a yellow plaque with black lettering hanging on a roadside post, indicating that a ‘murderer’ lives in this house, a collaborator of the former military regime involved in crimes. This is evidence of what can occur when transitional justice is lacking and victims take things into their own hands. From that perspective, how does he evaluate transitional justice in Poland? ‘Property restitution and penal accountability of representatives of the former regime is still needed,’ believes Professor Czarnota. At the centre of transitional research, both victims and victimisers are studied following the collapse of a regime. According to researchers, there can be no talk of justice until the victims are rehabilitated and the state reimburses them for the losses they sustained at the hands of the dictatorship’s functionaries. Professor Christiane Wilke of Canada's Carleton University warned in Warsaw that justice not rooted in the rule of law can become distorted and deteriorate into revenge against victimisers. The American professor called attention to yet another matter: research on transitional justice has shown that former victims regard financial assistance as improper and at times downright suspect. In his view, it is far better to honour victims symbolically. An unquestioned authority on transitional justice, Osiel is the author of several fundamental works on the subject. He advised prosecutors in the case against Chilean dictator Augusto Pinochet and on the prosecution of genocide in Rwanda in 1994. Researchers disagree as to whether prosecuting dictators who have given up power such as Pinochet and Jaruzelski is proper. ‘I recall the worldwide reaction to Pinochet's detention in London upon a motion of Spanish judge Baltasar Garzón in connection with murder and torture charges. Even former Polish dissidents such as Adam Michnik were opposed. Because it becomes known what your future holds when you lose power,’ Jiří Přibáň, a Czech professor from Cardiff University, explained. Professor Adam Czarnota recalled that in May the leader of the Burmese opposition and Nobel Peace Prize laureate Aung San Suu Kyi told him they did not want to sentence the junta generals but only send them back to the barracks. But all the discussion participants agreed that settling accounts with a regime looks different in every region of the world. It depends whether a system collapsed amid violent revolution, through the peaceful hand-over of power or – as in the case of Germany and Japan – resulted from a lost war. The latter instance was referred to by Professor Czarnota as ‘victor's justice’, as the victorious powers imposed their order on the vanquished. According to Professor Czarnota, with the exception of the Baltic states, there has been no transitional justice in the countries of the former USSR. It is no coincidence that the churches of Western Christianity essentially dominate in countries where transitional justice processes have taken place. Conference participants set the countries of our region up as examples for states making the transition from dictatorship to democracy. Deputy justice minister Wojciech Węgrzyn emphasised that account settling in the countries of the former Eastern bloc has incurred smaller social and economic costs compared to states in, for example, Latin America. Recently, Poland has even become something of an exporter of knowledge on ‘justice of the transformation period’. Last year, Polish NGOs, backed by the Foreign Ministry, organised training sessions devoted to justice in the transition period for Tunisians who have been trying to build democracy following the Jasmine Revolution at the turn of 2011. The lack of reprivatisation legislation has made the restitution of property a chaotic procedure. The losers include not only the rightful owners and the state, but also thousands of tenants living in nationalised buildings. There have been over a dozen draft proposals. Some were brought to a standstill in parliamentary committees, three were voted down and one was vetoed by the president. In a nutshell, this is the story of Poland's reprivatisation attempts. The present government had proposed paying for nationalised property in 2012, but in March 2011 the Treasury halted work on the draft. PLN 20 billion in compensation would increase the public debt and exceed the 60% precautionary threshold. Although 13% of Poland's citizens sustained losses as a result of nationalisation carried out by the communist authorities, Poland is the only country among the new EU members and one of four in the region (the others being Belarus, Ukraine and Albania) that have not carried out reprivatisation following the transition to democracy. When in the early 1990s owners began reclaiming their property in Czechoslovakia, Bulgaria and the Baltic States, and Hungary was issuing special bonds for them, Poland only managed to regulate the restitution of trade-union and church property. From that time, the chances for former owners to regain their property have dwindled year on year. 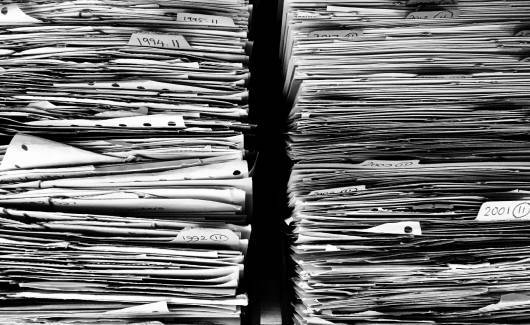 Not only have successive governments over the past two decades refused or been unable to pass the relevant regulations, but a changing approach to property restitution can clearly be seen in successive drafts. The 2001 law vetoed by Aleksander Kwaśniewski envisaged the State Treasury returning confiscated property to its rightful owners. Where impossible, former owners were to receive reprivatisation vouchers equivalent to half the value of the nationalised property. However, the draft abandoned two years ago made no mention of reprivatisation. Instead, it referred only to ‘alleviating the wrongs suffered as a result of nationalisation measures’ for which ‘monetary benefits’ were to be provided. 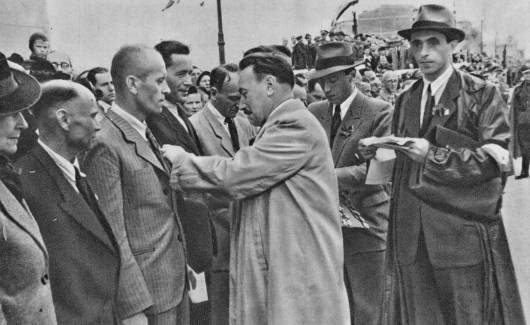 The decrees of the postwar communist-controlled Polish National Liberation Committee and the measures adopted by the parliament of the People’s Republic of Poland were to remain in effect. Former owners were to receive compensation only if the communist authorities had nationalised property in violation of their own regulations. These regulations were often insulting to an elementary sense of justice. The government did not intend to return a set amount of the property's value to its rightful owners, but wanted to earmark PLN 20 billion for that purpose to be distributed among former owners. Compensation amount would depend on the number of claims filed and would be strictly symbolic. Why do successive governments want to return an increasingly diminished share of nationalised property to its former owners? ‘Unfortunately, that is the normal course of events,’ comments Professor Włodzimierz Pańkow, a sociologist at Koźminski University in Warsaw. At stake are the interests of hundreds of thousands of new owners, who after 1989 took possession of property previously nationalised by the communists. Often members of the former communist party authorities were enfranchised in this way. Today, in most cases privatisation no longer involves actual restitution of nationalised property, since beginning in the early 1990s the state has managed to sell off a large share of nationalised assets. Most economists and sociologists agree that the abandonment of reprivatisation has adversely affected the Polish economy. A middle class has begun to emerge with great difficulty. The rural areas where nationalised property has going to ruin have lost out. And the lack of clear regulations is troublesome for tenants living in buildings being restored to their former owners. Do rightful owners still have any chance of regaining their property? Marcin Schirmer has not lost all hope. “At present, the Agricultural Property Agency has at its disposal nearly two million hectares of land, mainly in what are known as the recovered territories. Today, most of the land taken over by the communists can no longer be returned, but substitutional reprivatisation could be carried out if the political will existed. The lack of legal regulations means that former owners can and are attempting to seek justice on their own. The value of property confiscated after the war is now estimated at some PLN 40 billion. Specialist firms involved in consolidating claims and recovering real estate have been established. There is also much to indicate that reprivatisation in Warsaw has taken on more ominous forms. Business magazine Puls Biznesu has established that there are at least several groups in Warsaw specialising in making money on privatisation. It reports that members of these groups are consolidating claims to a small fraction of the real estate's value and subsequently, thanks to ‘nonstandard good relations with officials’, quickly recover the property. Each year, dozens of Warsaw tenements experience a similar fate. Tenants' organisations are up in arms, because the housing being reclaimed by private firms is occupied by tenants who had been granted council flats after the war. ‘The firms reclaiming tenements want to transform them into luxury apartments or tear them down and build new structures in their place,’ said Anna Kutyńska of the Warsaw Tenants’ Defence Committee. They use every trick in the book to force tenants, often elderly people who are unaware of the legislation, to move,’ she explains. ‘In theory, these tenants are protected by the law. In practice, however, there are many ways of circumventing it. A standard practice is to begin prolonged, make-believe renovations involving numerous hardships such as disconnecting the electricity, water and gas. It is sufficient to sit back and wait until the tenants are unable to put up with such conditions and begin moving out on their own. “Unknown assailants” are brought in to deal with those who still refuse.’ Since Warsaw is short of housing, the displaced tenants often have nowhere to go. How can the problems of Poland's capital be solved? Members of the Association of People Affected by the Warsaw Decree maintain that no new legislation is needed to restore most real estate to its rightful owners. ‘Existing measures regulating property issues clearly state that real estate taken over by city authorities should be returned to its former owner if it has not been put to the (city’s) intended use within seven years of the take-over,’ said Ryszard Grzesiula, a lawyer and the Association's vice-president. Its members have long been appealing the matter to the prime minister, president, MPs, senators and Warsaw city hall. The Decree Association has taken note of the problem of tenants evicted by private firms, and Grzesiula is proposing a solution: ‘The city council could be doing the same thing that private firms are. Many members of our association would forego their claims towards the council in exchange for a small proportion of the value of their real estate or a modest life annuity,’ he explains. Subsequently, real estate in good locations could be sold to developers for a fraction of its true value on condition that they build housing that includes council flats, so the displaced tenants would have a place to move. We have proposed that solution to the municipal authorities, but nobody even wanted to discuss it. The task of a truth commission is an arduous one: it involves creating from a set of subjective memories, often blurred by time and marked by trauma, a common narrative that will no longer divide society. Over the past three decades, in the course of media and scholarly discussions on settling accounts with the past, the institution most frequently invoked has been the truth commission. The origins of that concept should be sought in the bringing of the military dictatorship of Argentina to account in 1983. However, the truth commission owes its ‘international career’ to the Truth and Reconciliation Commission of South Africa, which functioned in 1995-2000 under the leadership of Archbishop Desmond Tutu. The ability for perpetrators to obtain amnesty in exchange for full disclosure of the truth about their crimes, public hearings evolving into religious ceremonies, and finally the charismatic chairman - all this meant that over the years South Africa and its truth commission were presented as a model solution to be used in other countries. It is worth noting that many of its ideas had been used earlier in committees of inquiry in Great Britain and its former colonies. The popularity of the truth commission and continuing academic deliberation as to what exactly such a commission should be has led to the widespread creation of public and private institutions bearing that name. Truth commissions have dealt with the causes of slavery in Mauritius (reaching back as far as 1638! ), evaluated the issues of doping in cycling or paedophilia in the Irish Church. The associated devaluation of the concept makes it difficult to determine the number of truth commissions involved in settling accounts with the past. 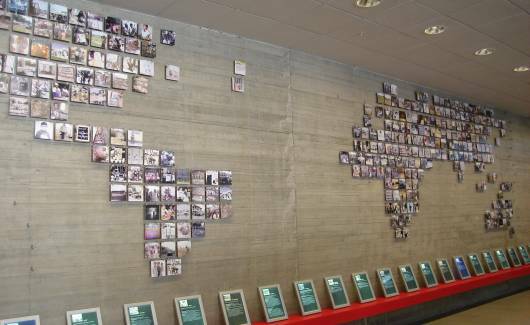 However, 22 truth commissions can be identified, operating in 21 countries around the world. They share several characteristics: they are public institutions (appointed by the State or an international organisation), they are extraordinary, they operated for a defined period of time, they are set up during a time of transformation, also after a period of authoritarian rule, as in the case of post-conflict peace-building; they deal with human rights violations in the past and focus on the victims of these violations. As can be seen, not all of commissions identify the perpetrators of crimes (some even omit this issue), and only two (in South Africa and Kenya) had the right to grant conditional amnesty. The last truth commission was established in Brazil in November 2011. Historically, the greatest threat to settling accounts with the past is the emergence of the phenomenon known as victor's justice. After a former authoritarian regime has given up power, following the signing of a peace agreement, ‘after every war someone has to clean up’ (W. Szymborska). The desire to obtain quick redress for grievances leads to self-appointed courts, show trials and witch hunts without guaranteeing the rights of offenders, without seeking to justify their circumstances, without regard for the future. Revenge by some generates a sense of grievance in others; it creates a vicious circle which in the long term prevents reconciliation. Truth commissions are usually established on the basis of a worked-out compromise that in all appearances may seem unacceptable. Acknowledging social peace and future reconciliation as the highest values, they try not to violate the agreements of transformation. The former opposition accounted for one-half of the members of Chile's truth commission and people involved in the Pinochet regime made up the other half. The representatives of various racial and religious groups sat next to each other in the commission in South Africa. These commissions were also careful about naming the perpetrators (making it possible to investigate the fate of the victims of the Chilean junta). Truth commissions are sometimes accused of maintaining the impunity of perpetrators. However, in situations following internal conflict, when any criminal proceedings could threaten a return to violence (such danger existed for example in El Salvador), or if after the departure of authoritarian rule the armed or security forces continued to protect their interests (as in the countries of South America), the establishment of a truth commission becomes the optimum solution - as often pointed out by political journalists - second only to the courts. During a period of authoritarian rule, when judges cooperate with the authorities to cover up their transgressions and government officials deny that they ever took place, a truth commission, with the participation of recognised spiritual and secular authorities, seeks to bring this truth to light. 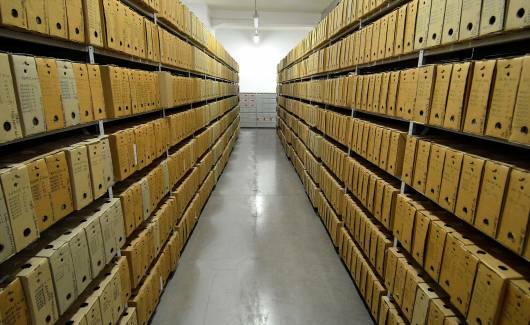 Initially, commissions were limited to collecting data from police and military archives, carrying out interviews with the families of the victims and exhumations. Since the establishment of the commission in South Africa, public hearings have become their most distinguishing characteristic. At such hearings, victims are able to present their truth about the crimes carried out, and the perpetrators are able to explain what guided them. From both of these monologues a truth commission is able to produce a new narrative: the truth about the past. This reference to subjective truths, to people’s memories, has allowed the past to be talked about in a language different from that of dry NGO reports or those found in secret-police files. Hearings held by truth commissions have become spectacles: they have revealed all the drama of what being a victim and a victimiser is all about. Addressing the motivations of individual people is perhaps the greatest achievement in the history of these commissions. It is not difficult to note that the task of a truth commission is an arduous one: from a set of subjective memories, often blurry after many years and marked by trauma, to produce an intersubjective narrative that will no longer divide society. Although the role of the members of truth commissions has been entrusted to authority figures, this has not protected them from accusations that they lack impartiality in the creation of narratives about the past. Even the model commission of South Africa was seen by the white population, according to a 1999 study, as a tool of revenge. In a criminal case, typically the accused is th4e central figure, round whom the proceedings take place. But truth commissions were set up give a voice to the victims. The fact that they were not judicial bodies gave them the opportunity to function on a more flexible basis: they have often been compared to a treatment and healing process. However, giving a voice to the victims has led to two paradoxes which seem to have diminished the popularity of truth commissions as a means of reconciliation in the early twenty-first century. The first paradox concerned the perpetrator-victim relationship. In Chile and Argentina, the division was clear: the victims were mostly left-wing opposition activists, whilst officers of the security forces and the army were the perpetrators. However, very soon it turned out that these categories were not mutually exclusive. In El Salvador, both parties to the conflict were guilty of crimes; in Sierra Leone it was not possible to even identify which of the warring factions was the government side; the truth commission of South Africa faced the problem of human rights violations carried out by activists as an expression of opposition to apartheid; in Ecuador there emerged the problem of extensive ranks of police informers. It turned out that being the perpetrator and the victim is not as straightforward as it seemed at the beginning of transformation. The second paradox is associated with the mechanics of a commission's operation. The more flexible and open the procedure is to the voice of the victims, the smaller the range of guarantees of a fair trial for the perpetrator. Can one then evaluate the past by violating human rights and making the past offender the present victim? Faced with that dilemma, successive truth commissions have developed a set of procedural guarantees, which have ultimately made commission procedures resemble criminal proceedings. The functioning of a truth commission shows that human rights violations are not made in a vacuum. Its effects do not apply only to the perpetrator and the victim, but cover the whole of society. Therefore, a commission operates in public, it makes its reports available, and its meetings take on a solemn character. A truth commission is the beginning of a new history for the whole of society, in order to prevent it from returning to authoritarianism or conflict. 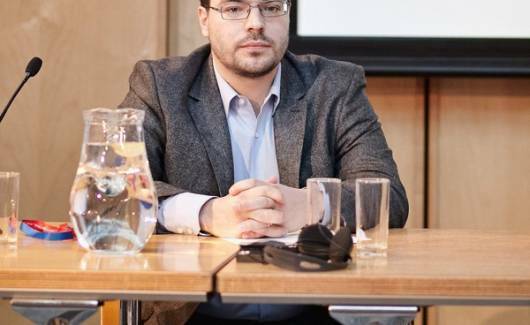 MARCIN KOMOSA holds a doctorate in political science and is a cultural anthropologist, the author of the monograph Sprawa Pinochet. Odpowiedzialność za naruszenia praw człowieka (The Case of Pinochet. Responsibility for violating human rights) 2005, and the book Komisja prawdy. Mechanizm odpowiedzialności za naruszenie praw człowieka (The Truth Commission. A mechanism of responsibility for human rights violations) 2013. The text in Polish was published in a special Genealogies of Memory supplement in the latest issue of Tygodnik Powszechny on 11.12.2013. The Academic Committee of the Conference consisted of Maciej Bugajewski (Adam Mickiewicz University, Poznań), Burkhard Olschowsky (European Network Remembrance and Solidarity), Małgorzata Pakier (School of Social Sciences and Humanities, Warsaw), Gertrud Pickhan (Free University of Berlin), Jan Rydel (European Network Remembrance and Solidarity), and Joanna Wawrzyniak (University of Warsaw). From 23 to 25 November 2011 over 100 historians, sociologists, and cultur al studies scholars from Poland, Germany, the United Kingdom, Ukraine, Romania, France, Lithuania, Hungary, Belgium, Austria, Russia, Australia, and the United States discussed the specific qualities of European memory, and methods of studying it, at the Warsaw University Library. Participating in the sessions were both eminent experts in the subject and representatives of the younger generation of researchers. Based on the assumption that the European perception of the 20th century is dominated by the Western European point of view, the organizers of the conference asked about the importance of the historical experiences of the ‘bloodlands’ of Central and Eastern Europe for international studies of remembrance. Moreover, they wanted to focus the attention of Western European experts on the achievements of Central and Eastern European in the humanities, and to consider how the theories and notions established in the region could be introduced into international circulation. Far from promoting a claim about the exceptionality of the region, however, Małgorzata Pakier and Joanna Wawrzyniak in their introduction to the conference emphasised the importance of the comparative perspective and the need to develop an analytical approach to allow the development of ‘Eastern European’ and ‘Western European’ studies of remembrance in a mutual dialogue. The keynote address on ‘The Transformative Power of Memory’ was delivered by the German cultural studies scholar Aleida Assmann of the University of Constance. The proceedings continued in parallel sessions: (1) History and memory in Central and Eastern Europe: How special? (plenary session), (2) Lieux de mémoire, (3) Theories and concepts (with sessions on traditions and proposals), (4) Dynamics of memory (with sessions on biographies, generations, borderlands, silence and Articulation, private/ vernacular – public/official, and struggles for power and legitimacy), (5) Media of remembrance (with sessions on space/place, the museum, film and literature, the various roles of historians, and history in the public domain). The final discussion (What memory for what past – what theory for what memory?) was chaired by Jeffrey Olick, an American sociologist from the University of Virginia, who also closed the conference. Joanna Wawrzyniak, University of Warsaw. Works at the Institute of Sociology, University of Warsaw, where she is the head of the Social Memory Laboratory. She holds MAs in history (University of Warsaw) and political science (Central European University) and a doctorate in sociology (University of Warsaw). Her academic interests and areas of study include: politics of memory, veteran and war victims’ organizations in post-war Poland, historical city museums in Central and Eastern Europe, as well as oral history of democratic opposition and privatization processes. She is interested in the relations between history and memory, and also in the history of memory studies in Poland.